I read recently that the best artists whom we hold as the most “talented” are actually the ones who often work the hardest and have crafted their skill over many years. They may have talent, but to refine that and harness it takes hard work and dedication. Painting a masterpiece or carving a piece of furniture or creating a beautiful score of music takes hours of training and dedication. An artist was asked “how long” it took him to paint a particular piece or work that someone was admiring. His answer was “sixty years” because that is how long he had been learning his craft which led to him being able to paint this recent piece. God also is the business of shaping and crafting and forming people into his image and the fullness of all we were created to be. Yet this formation takes time and there are no short cuts. Most of us lead unremarkable lives that have seemingly little impact of any real significance, yet God is shaping or wanting to shape us uniquely for his glory and purposes. However, we often want to race to the end or shortcut the process and get to the “glory” bit (often our glory) without going through the formation. Many people in the Bible took years to be formed by God. Moses (40), David (at least 13), Joseph (2-5 years as a slave and imprisoned).. That doesn’t mean God doesn’t use us in the formation process, but sometimes we down play the formation and just want to be at the end when we look back and make sense of it all. 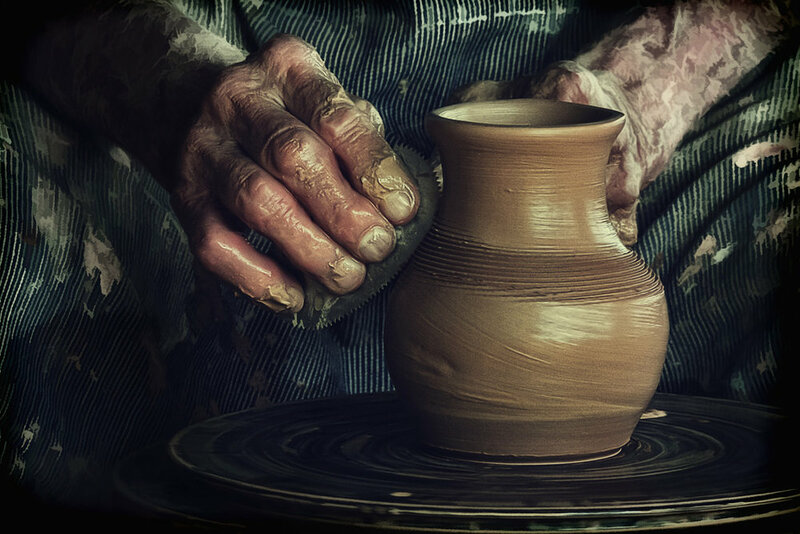 But God is the potter and we are the clay. We need to allow ourselves to be softened in his hands and trust that the pressure that is applied to shape us is done in love. We can trust the pressure and direction of his hands because they hold nail scars that tell us he loves us and he is forming each of us as he sees best to be used in the unique purpose he has, no matter how unremarkable that might seem to us or others. So being formed and shaped by God through the ups and downs of life is vital to becoming the person he wants us to be. But we must remain soft and not hard hearted toward him and we must trust that he knows us better than we know ourselves. He knows whether we should be a “plate” or a “jug” or a “bowl” and how he wants to use us in his Kingdom work on earth. Don’t look at someone else and wish to be like them, just be open and allow God to form you.